We are proud to introduce the Black Vortex MB174U3S-4SB, the USB 3.0 and eSATA quad bay external enclosure with an eye catching design and removable drive feature. This unique HDD enclosure is designed for computer enthusiasts and gamers who need massive storage device without modifying their system or taking up additional system space. The MB174U3S-4SB accepts up to four 3.5" SATA 3 hard drives with blazing fast USB 3.0 and eSATA interface. The built-in 120mm cool blue LED fan with all around mesh design provides excellent cooling to the drive which can extend HDD lifespan. The easy access fan speed control and LED brightness control allow you to configure various setting that fits your need. Lastly, the EZ-Grip handles gives you the ability to replace drives in a matter of seconds. 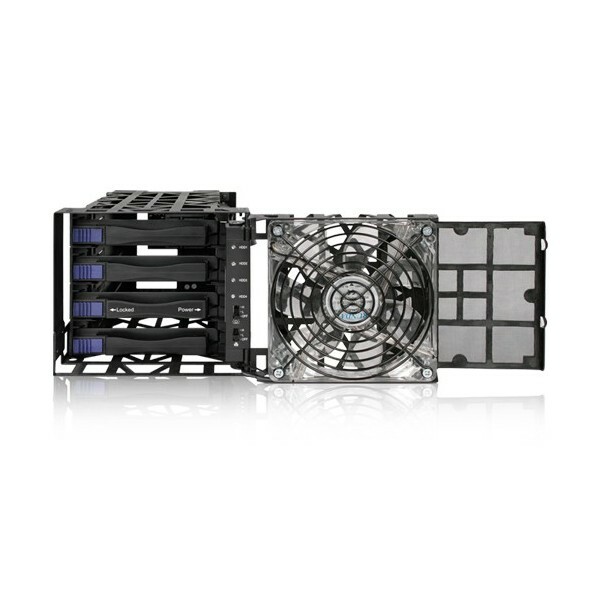 The Black Vortex MB174U3S-4SB is a must-have multi-bay enclosure that perfectly blends performance and aesthetics.